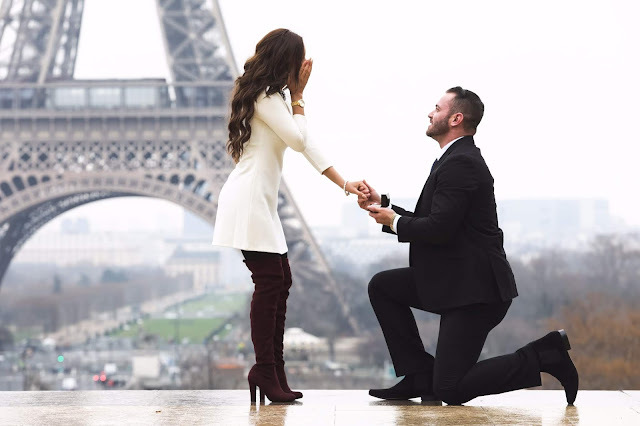 Every engagement is special and unique on their on way, but the next proposals are just so beautiful and full of love that it's even amazing to look at them! Now 10 beautiful bride share their lovely moment in the most beautiful locations, when they finally said "yes" to their loved one. Congrats to all of them! Vishalini and her fiancé, David met at the college 6 year ago and however they studied in different states in Malaysia, the two got to know each other with the help of their mutual friends. They started dating, however the things haven't been serious between them til 2016, when they had their first oversea trip to the Hong Kong Disneyland, where David got down on one knee and asked Visha to be her girlfriend. In May 2018 the couple had a European cruise trip all over Greece and a mini-vacation to the island of Santorini, where they wanted to have a professional photoshoot - the couple doubt that they will be ever back here again because of the total 18-hour of flight in one-way from Malaysia. "We had our photoshoot in a beautiful scenery of Oia, overlooking the sea, the caldera and the blue domes and David suddenly just got down on one knee and asked: Would you marry me and be in my life forever? Of course I said yes with a wide smile and since then our love just keeps growing everyday." - said the beautiful Visha who is getting married to David on September 1, 2018 on a beautiful island at the Westin Langkawi Malaysia. McCall and her fiancé, Michael got to know each other through Michael's little sister, who attended the same college as McCall. 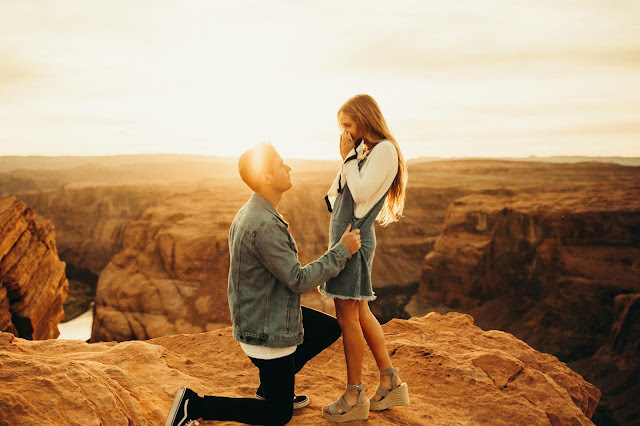 The couple started dating at April 2017 and however they knew they want to get married in the near future, McCall had no clue that her boyfriend going to propose her - especially at one of the most beautiful places in the world! "We are still working on wedding plans, but we have gotten the big important thing done. Our wedding is going to be at August 16th at Provo City Center Temple and the reception will be at White Shanty in Provo, Utah." - said the beautiful bride, who already picked her dress at The Perfect Dress salon in Salt Lake City. The beautiful McCall also shared that they are probably going to have 10-15 bridesmaids/groomsmen and their Boho themed wedding's main colors are rose gold, than creme, light gray and faded pastels. The blogger Felicia and her fiancé, Jan have been in a long distance relationship for 6 years before he proposed her. "It's something that we have discussed before but I never thought it would happen so soon!" - said the beautiful bride, who met with her dream man in a boarding school in England back in 2009. 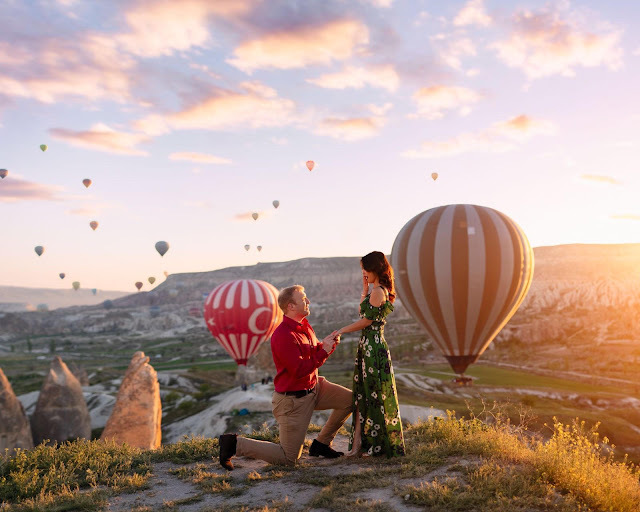 The couple travelled to Cappadocia for an anniversary-holiday and Felicia told her boyfriend that she want to get a photographer to take photos about them, as the landscape and hot air balloons looks magical there. The morning he proposed, the couple went to a place called "Sunset Point" and after discussing their adventures and real feelings during the shoot, Jan was on one knee asking Felicia to be his wife. "The view was amazing, the photographer captures the moment perfectly. I couldn't dream of a better proposal!" - said Felicia who's going to have a family-only wedding in Germany this September, and in 2019 to have their wedding celebration in Lake Como, Italy with all of their loved ones. Isadora and her fiancé, Américo scheduled a romantic holiday in June 2016 to the United Arab Emirates to celebrate their 6th anniversary of dating.When they arrived to Dubai, Isadora's partner surprised her with tickets to her dream place, Maldives and they immediately drove to the other airport to fly away again. On the 2nd day of their Maldives vacation, Américo planned a sunset boat tour, so they got dressed up, however Isadora was surprised that instead of a group tour it's only the two of them. "Then two photographer arrived and somewhere on the boat our favorite song started to play. I still thought it's just an anniversary surprise by him, but then one of the resort's staff brought a lovely bouquet ordered by him to me and Américo kept a beautiful blue box in his hands..." - said Isadora. Américo started to saying his beautiful words and then he got down on one knee and asked her to marry him. "In the middle of the Indian Ocean, on a paradise island in the Maldives with a wonderful sunset I felt myself so blessed and happy! I have no words to describe what I felt and still feeling it." - said the beautiful bride, who later had a dinner by the sea, at a table surrounded by candles shaping a heart. The next day the couple had an engagement photoshoot. The couple's wedding will be at October 20th 2018. April's fiancé, Spencer surprised her with an amazing Europe trip to celebrate their love. The couple first visited London, then Paris - they were amazed by the beautiful landscapes and museums! On their last day, Spencer suggested April to get dressed up, go out and visit the Eiffel Tower for one last time. "I supposed to wear a pair of jeans, but he advised I should maybe wear something more elegant. I found it so cute that he want to help me, so I went out in the outfit he pulled out for me." - said the beautiful bride, who just wanted to take some amazing shoot with her phone but when she turned around, she saw Spencer down on one knee! "His eyes were full of tears and he had the biggest smile in the world! It was just me and him in that moment... he asked 'Will you marry me?' and I just said 'Yes, Yes, for the rest of my life yes!!!' - said April who is going to have her wedding this fall in California. Rachel's fiancé, Kornelius set up a whole fake photoshoot to ask her to marry him! 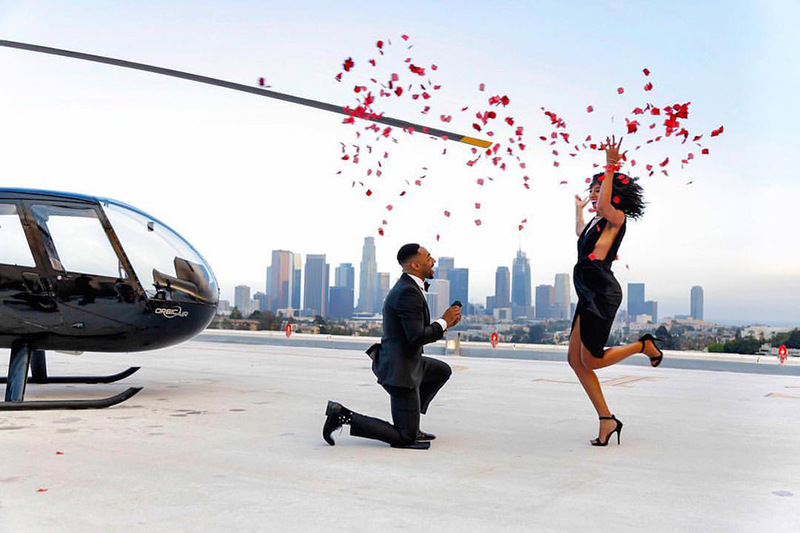 The photoshoot located on a helipad in LA and the couple was posing at the front of the camera, when the photographer asked Rachel to hold rose petals in her hand and take a magical spin end up facing Kornelius in the shoot. "I begin the spin and the next thing I know that I see Kornelius down on one knee! All I was able to do is smile and grab his hands as he said some of the sweetest words... I felt myself that I'm living my dream." - said the gorgeous bride, who also told that they were so happy that they totally forgot to put the engagement ring on her finger! The couple planning to have an intimate wedding with the closest friends and family on the east coast of USA. The make-up artist Pascale and her fiancé, Jessy are best friends since 2006, but they started to dating just in 2010 at the age of 16 as 'high school sweethearts'. "It's truly a blessing to have a love story like this! We are soulmates who genuinely care, love and be there for each other." - said the beautiful bride, who have always known that Jessy is going to be her husband. 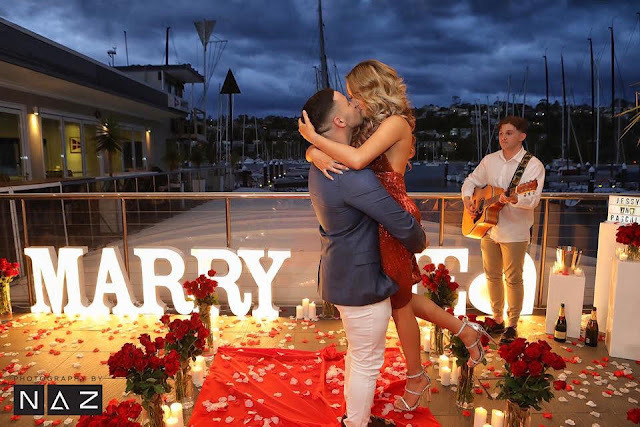 Pascale's fiancé started to prepare for a "work event" months ago, however when the date has finally come and the couple arrived to the amazing Middle Harbour Yacht Club, Pascale saw the rose petals on the floor... It turned out that there won't be any work event, but a proposal! "He left me speechless with a fairy tale romantic set he put up for me! I was teary as I listened the amazing music and his words of love about the past, present and future...He asked me to marry him, and as I said yes I couldn't stop kissing and hugging him! I mean he even hired a photographer and a videographer who captured our special moment!" - said Pascale. The couple is going to have their engagement party on July 14th 2018 and already booked their wedding date on July 20th 2019. You can check their perfect proposal video here. The blogger Vanessa and her fiancé, Bobby got engaged in April 2017 in the most beautiful way! "We had a big Asian trip including Japan, China and Bali/Indonesia. When we arrived to Bali, Bobby asked me to do my hair, makeup and wear a white dress... well, I just had a white blouse and short with me but I thought it's good enough because I usually don't dress up while I'm on vacation." - said the lovely bride, who visited the famous Tegalalang Rice Terrace with her boyfriend on the next morning. "Bobby handed me a sweet letter... as I finished reading his amazing words he got down on one knee with a ring in his hand and asked me to marry him. I was so surprised but of course I said yes!" - said Vanessa, who had been dating with his boyfriend for 9 years and explored 30 countries with him before their engagement. The couple's beautiful moment was captured by their tour guide, who was apparently a hired photographer, Gusmank. 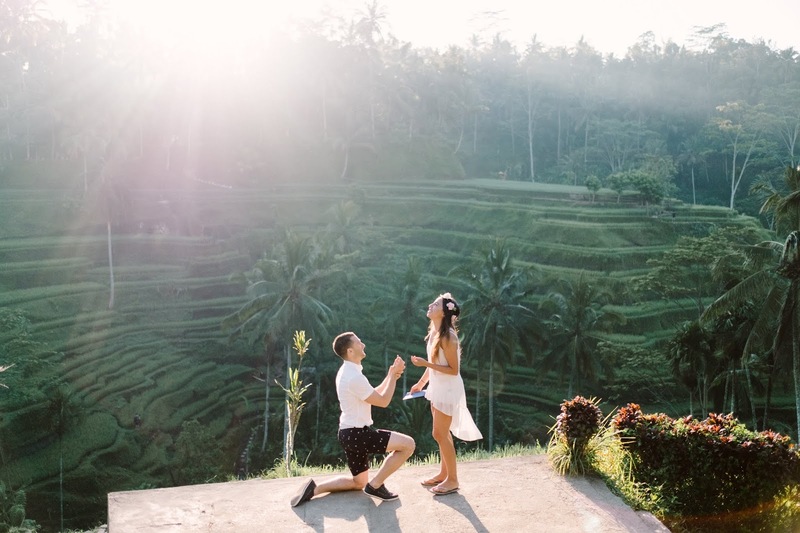 The newly engaged lovelies explored the rice fields and spectacular waterfalls after the proposal and had a dinner at the Ritz-Carlton Mandapa. You can check out the couple's lovely day in this video. "We are planning to get married in 2019 in a little town called Antigua in Guatemela. The plan is to do it in a historic monastery built in 1734 and we're hoping that our friends and family can fly to join us!" - said Vanessa. 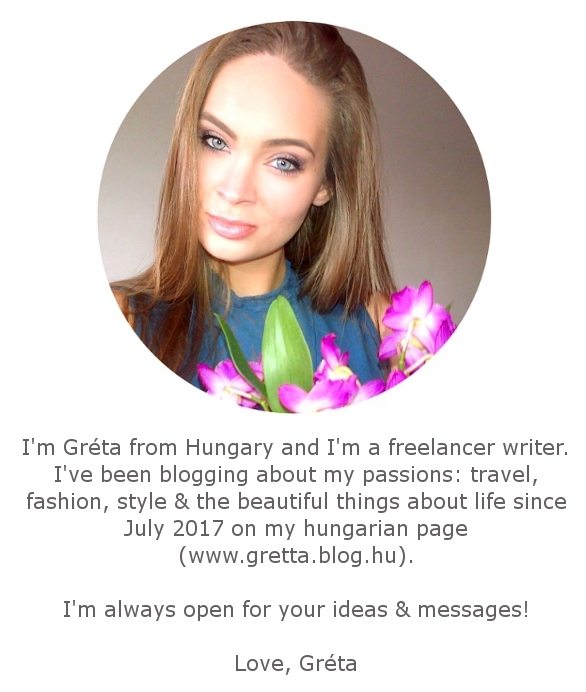 The Instagram influencer, Tamara & her fiancé, Stéf got to know each other not a long time ago: "I am from a small Austrian village, close to Tyrol and my fiancé is from Frankfurt. More than 7 hours separated us by car, but we decided to give our love a chance!" - said the beautiful Tami. The couple first met in Amsterdam and on their first date, her boyfriend immediately told her that she's the One for him and would like to marry her soon. 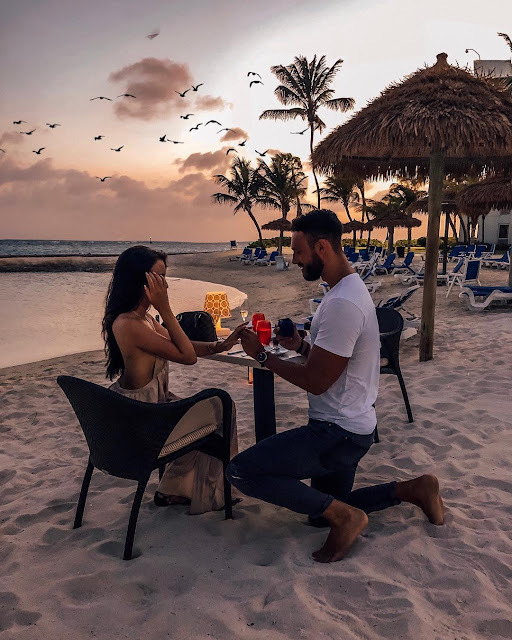 "Stéf made my 21st birthday unforgettable by taking me to one of my dream places, to Aruba's amazing Renaissance Private Island & Resort where we were able to have a bath with the pink flamingos. On one of our dinner date on the beach, he got on one knee and asked me to marry him." - said Tami, who can't wait to be Stéf's wife and they are looking forward to have kids in the near future as well. After seeing this, I wish to experience that kind of proposal too however it wouldn't happen since I have no boyfriend. lols! To travel is to live. Anyways I really love your post. Thank you.